Start your engines! Get ready to roll! GO! This R/C buggy car is blazing fast and responsive. This car is full function, it can drive forward and backward, steer left and right. 4 smooth tires are installed for amazing drifting action. With 0.3MP wifi FPV camera, the drifting journey will be more exciting. Your kids will love playing with this cool car! PS: The phone in the picture is not included. 2.4GHz control system, ensures the strong anti-jamming capability. 1/18 scale 4WD Drive system car comes with a set of dedicated tires, it&apos;s more powerful and you can enjoy fun. Equipped with 0.3MP Wifi FPV camera, you can take photos or videos and enjoy more FPV shows. 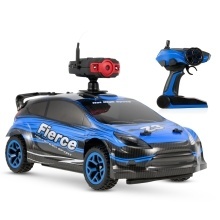 Remote controlled car will ignite child&apos;s imagination and naturally encourage learning through play. Best choice for birthday, holidays, graduation, Christmas, and any other kids&apos; education occasions. This RC model is not suitable for children under 6 years old.